1. 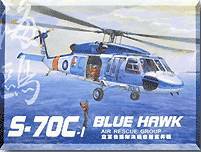 AFV Club have released their 1:35 S-70C Blue Hawk Rescue Helicopter #35S13. The relatively high price makes me think that this cannot be a re-box of the Academy / MRC mould, but an all-new one; though this is just speculation. 2. Although their is nothing about it yet at their website, it appears that Fonderie Miniature are planning to release an SA565 Panther in 1:48, #6030. The decal options are understood to be for Aeronavale, Brazilian and Chinese aircraft. This may be a co-operative release between Fonderie Miniature and Trumpeter, or it may be an all-new moulding - more speculation! 3. Next in their series of limited-issue decal-variants of their 1:72 H-46 / KV107 kits, Fujimi have released #27002, their 'Hotel California' CH-46D with 'special added decals' for HC-3 1978 'Golden Arches Airlines' and 1979 'Golden Arches 1103'. Two HC-3 'Pack Rats' Vertrep machines were based on the USS 'White Plains' Mars-class Combat Stores Ship AFS-4 (not the abbreviation for 'Attack Food Ship', as some of the crew claimed) out of Yokosuka, Japan. Originally dubbed 'The Golden Arches Express' (complete with the gold arches on their tails & the old McDonald's slogan, "We do it all for you" painted on their bellies), they were later changed to 'Orient Express Airlines' in keeping with another of the ship's nicknames. In April Eduard are planning to release an etched set for the 1:72 EH101 Merlin, variants unknown. 5. Czech Master Kits have released #7079, a detail set for the exterior of the 1:72 Italeri UH-1B. 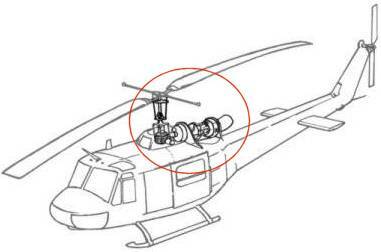 This appears to concentrate on the area of the rotormast, main gear-box, and engine. There should be a set for the UH-1B interior to follow quite soon. 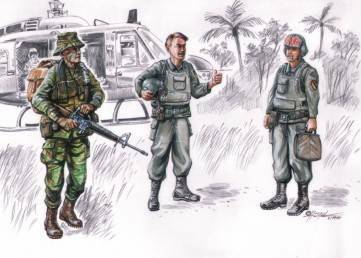 Also new from CMK is #72076, a set of 3 'Vietnam LRRP US Helicopter crew' figures. 6. Updating Gekko Graphics' plans (HKN #162), if all goes well they hope to have their first Cobra sheets out in the next month or two. These will be for AH-1W's used in Desert Storm in all the various camouflage schemes used, and will be available in 1:72, 1:48 and 1:35 scales. The next one will be for US Army AH-1's used in Desert Storm and will be available in the same scales. Later in the year will be US Army Cobras during the Vietnam war period. The 1:72 USS Peleliu sheet should be ready by mid-year, and will be followed by a 1:48 scale sheet for AH-1W, UH-1N and AV-8B's off the Peleliu, all in the low-vis greys with 'eyes' on the noses. All this is of course dependent on many factors (such as the printers), so let's hope for the best. 7. Wydawnictwo Militaria have published a new volume in their 'Militaria in Detail' series. #12 - 'Bell UH-1D Iroquois (Huey) in detail', by Pawel Przymusiala. 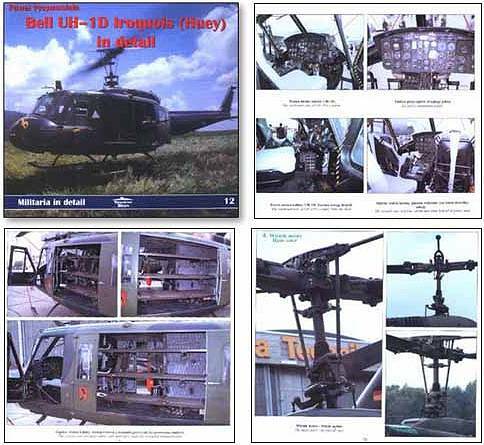 "220x245 mm, 108 colour photos, 1:72 plans, interior and exterior details of famous Huey helicopter." ISBN 83-7219-157-8, Polish/English captions. 8. We are promised that Lennart Lundh's history of the S-62/HH-52A family will finally be out from Schiffer Publishing at the end of this month. 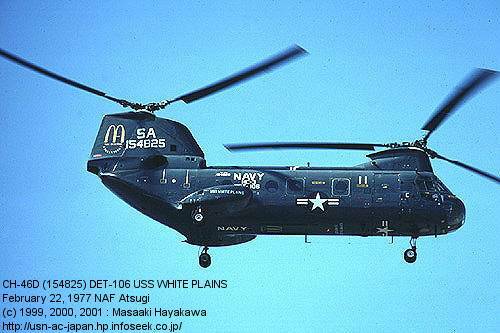 Wayne Mutza expects to deliver his history of the H-6 type to Schiffer anytime now. That means we could see it in print by this time next year, assuming Schiffer move with their usual speed. It sounds like it's time for Loach-lovers to stockpile some kits while they're still available (Italeri have discontinued their 1:72 versions). Those familiar with the quality and depth of Wayne's research will no doubt expect to find much modelling inspiration in this book.